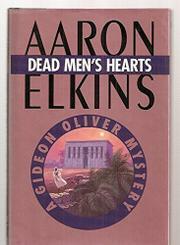  Elkins (Old Scores, 1993, etc.) sends Gideon Oliver-- professor, anthropologist, and sleuth--to Egypt with wife Julie, where he will narrate a TV documentary for the Horizon Foundation about its work at Horizon House in Luxor and other sites in Egypt. The hectic schedule of the film crew, headed by old hand Forrest Freeman, is abruptly slowed when a scatter of human bones is found in a remote part of the Horizon House compound. Pompous, little- liked Horizon House director Dr. Clifford Haddon swears he also saw a quartzite head, now vanished. Days later Haddon is killed, accidentally perhaps, as the crew makes its way up the Nile on a cruise ship. There are long, drawn-out discussions on the origin of the bones (how old are they?) and leisurely chats with Egyptian police, the Luxor House staff, and shady dealers in antiquities. It all ends in the canyons of the Western desert with a melodramatic confrontation that challenges Gideon to the max. A tedious, confusing puzzle takes second place to the author's wryly literate style, which captures the color, danger, and ancient glories of the Egyptian scene.